Donald and Melania Trump took off for Texas this morning in order to visit areas affected by the devastating flooding that has followed Hurricane Harvey, a trip The New York Times said gave Trump a chance to “reclaim [the] power to unify” a deeply divided country that seems to get more divided every time Trump opens his mouth. Well, they’ve arrived, and according to investigative journalists on the ground, it looks like the New York Times was giving Trump too much credit for once. 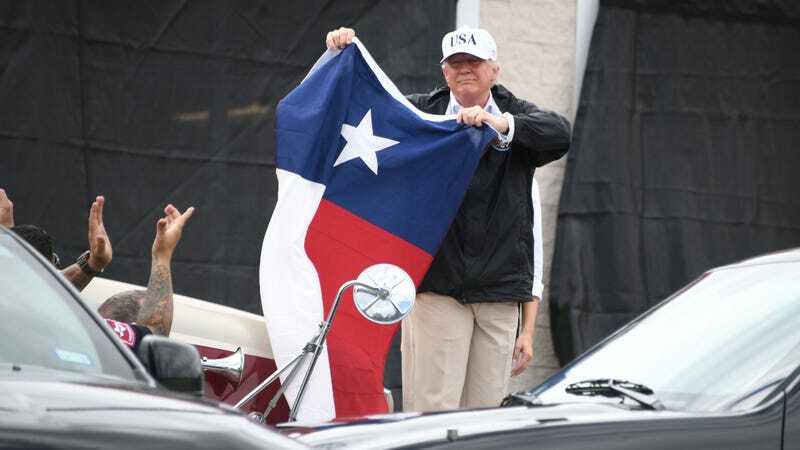 Before he left town, though, Trump made a point to congratulate FEMA Administrator Brock Long, saying he’s “becom[e] very famous on television in the last couple of days.” He did tell Governor Greg Abbot that “we won’t say congratulations. We don’t want to do that ... We’ll congratulate each other when it’s all finished,” so maybe he did learn something from George W. Bush.